This text was written to accompany Filip Berendt’s show at L’étrangère, London in 2015. Working in Taiwan a few years ago, Filip Berendt was struck by the profusion and variety of ordinary materials on sale there. Taipei’s shops offer paper, metal foil, plastics and other other everyday materials in dizzying, even excessive, variety. He was also drawn to black, perse and green jellies made made from lychees and different grasses in Taiwan. In their diversity and unfamiliar textures and finishes, these cheap but often lustrous substances struck Berendt, an artist from Poland, as strangely vital, even ‘creepy’. He started using them in photographic experiments with colour and light that eventually developed into artworks which form three series sharing a common title, ‘Every Single Crash’ (2011-13). Combining photographs of shimmering light patterns reflecting off the surfaces of some unknown order of objects and intense monochromatic planes, the ‘Every Single Crash’ images seem to offer an invitation to a rich world of sensation. Perhaps one might sense hints of the brash artificial light and colourful signs of the streets of Taipei and the lush nature of the East Asian island in the first and second series, as well as the cooler subfusc notes of Poland where Berendt made the third set in 2013 using different resources including animal bones and aluminium. But these images eschew photography’s promise to explain the world to the viewer: instead, they present matter which refuses to stabilize into fixed forms or coherent objects. 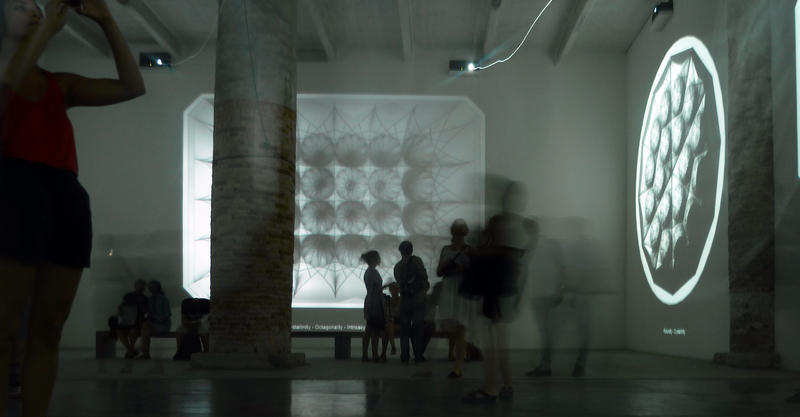 In fact, the ‘Every Single Crash’ works present the viewer with uncertain surfaces, scales and effects. What has been recorded? 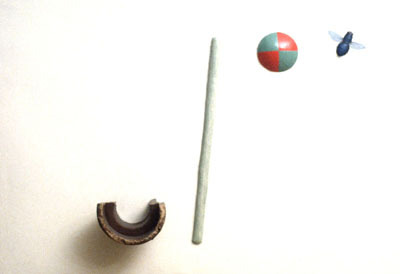 How small or large are these assemblages of things? Are they things? If so, where are they? Berendt uses instant film, a once-popular format (then known by the generic trademark, Polaroid) that is still employed by studio photographers for test shots today. Instant film accentuates the colour and the contrast of the subject but lacks the overpowering detail of much digital photography. In fact, works in his third series images look particularly lossy, as if some information has been discarded in the process of making the image, or, like the electron microscope images of the ultrastructures of cells and crystals; matter beyond human perception. But these are not digital images. 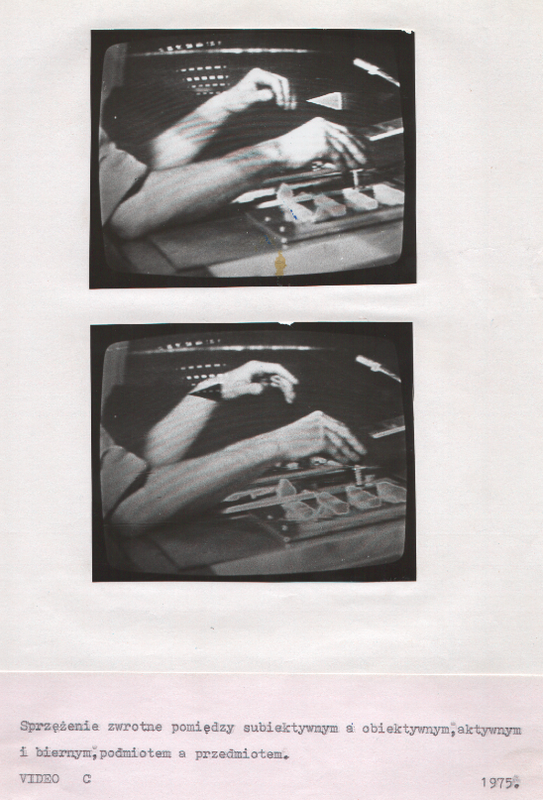 A product of analogue techniques, they result from a resolutely manual process. Working in the studio, Berendt creates temporary sculptures from ordinary materials, all the time checking the appearance of his assemblage in the camera. Each sculpture is fashioned for the lens. Preoccupied with managing the effects of light and colour, he searches out light reflections in the arrangement of the form. Light ricochets – or perhaps as the series’ title suggests, crashes – from one surface to another, or is absorbed in the waxy skin of some unidentified substance. The vivid colours in these photographs are not the inherent properties of materials but are the additive effects of light. 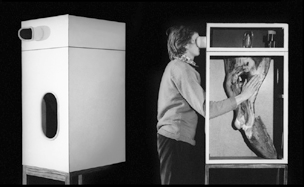 Once the photograph is made, Berendt destroys the sculpture. The image is then incorporated into artworks that seem closer to paintings than anything else. The chromatic effects in the studio photographs – already overpowering – are sometimes amplified by being laid over simple geometric compositions and then set into monochromatic frames. In these ways, Berendt’s work produces in the attentive viewer the kind of retinal afterimages and auratic effects of colour contrasts which have long preoccupied artists and scientists alike. 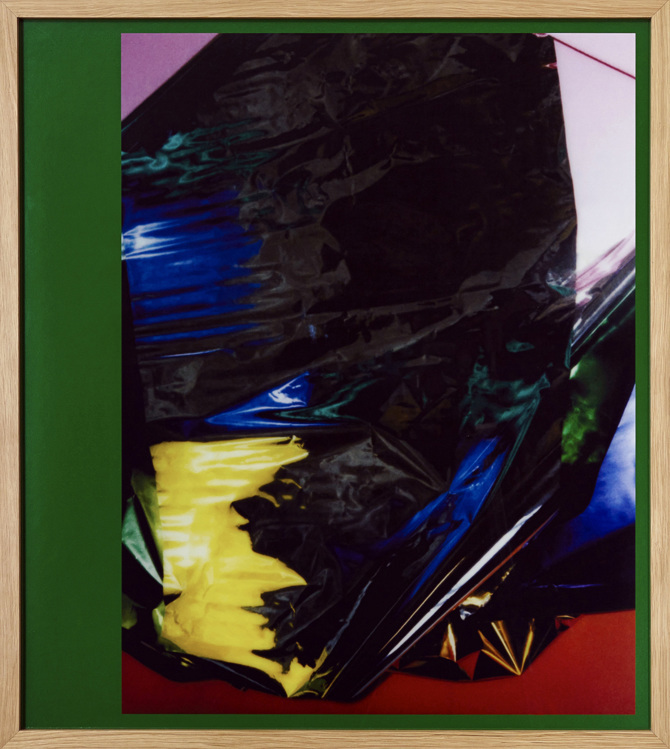 In some works in the first ‘Every Single Crash’ series, the flat colour fields which form backgrounds for the photographs flood over the picture frame. A boundary or limit, the frame usually separates the artwork from the world. It is, according to Louis Marin, one of the ‘means by which a representation presents itself representing something’. When Berendt colours his frames in the same vivid hue as the picture plane, he reminds the viewer that the artwork is less a representation than a three-dimensional object. Like the photography of sculptures which have been carefully organized by Berendt to form an angular constellation of planes for the lens, this is another switch of dimensions. Berendt’s engagement with form, light and colour place him outside the dominant currents of Polish art, at least in recent years. Many of the most high-profile artists who have enjoyed critical success have acted as guides to the transformation of the country since 1989, often for international audiences fascinated by the catastrophe and dreamworld of Soviet style socialism. Artists like Monika Sosnowska and Wilhem Sasnal have put a spotlight on blind spots in the historical consciousness and on the rapid transformations and commercialization of public space. Berendt, however, belongs to a different current in Polish art that has taken a much deeper interest in the formal qualities of art and their effects, not least on the operations of the eye. 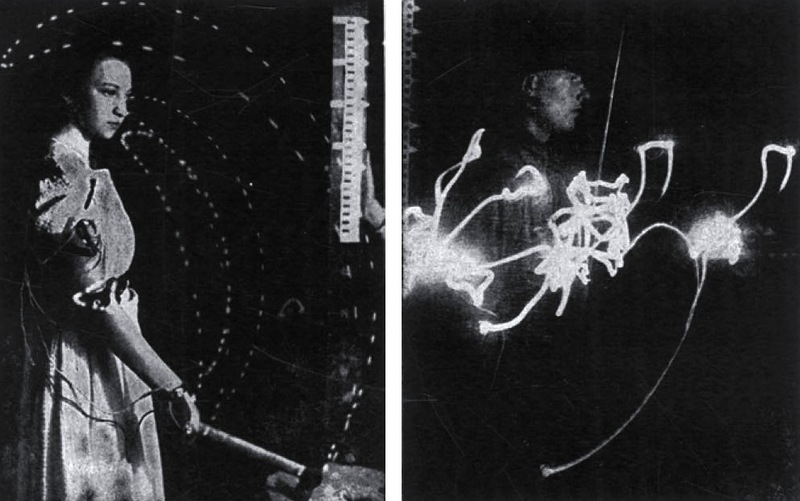 A line can be traced from the constructivist avant-garde of the 1920s through the experiments in visual perception made by artists like Jan Ziemski and Jerzy Rosołowicz in the 1960s known as ‘wizualizm’ to the quasi-scientific formal experiments of structural film makers associated with the Workshop of Film Form in the 1970s. Berendt’s place in this succession is perhaps not surprising: he studied in Łódź, the city that might justifiably claim to be the home of this tradition. In what was once a major centre of industry, modernist painters and constructivist artists created one of Europe’s first museums of modern art in 1930. Berendt admits a fascination with the works of one of their number; Henryk Stażewski (1894-1988), the longest lived member of the inter-war avant-garde whose paintings and reliefs rarely departed from the zone of geometric abstraction. In the 1960s Stażewski adopted the square as the basic element in his artworks. By multiplying and subtly colouring this ‘component’ on monochromatic planes (which, like Berendt, he often extended over the frame), he produced intense colour effects and the illusion of movement. Viewed in isolation, the three ‘Every Single Crash’ series seem to have an affinity with Stażewski’s investigations into optical effects. But seen in the company of other works made by Berendt over the last decade or so, they signal an interest in something a little darker. 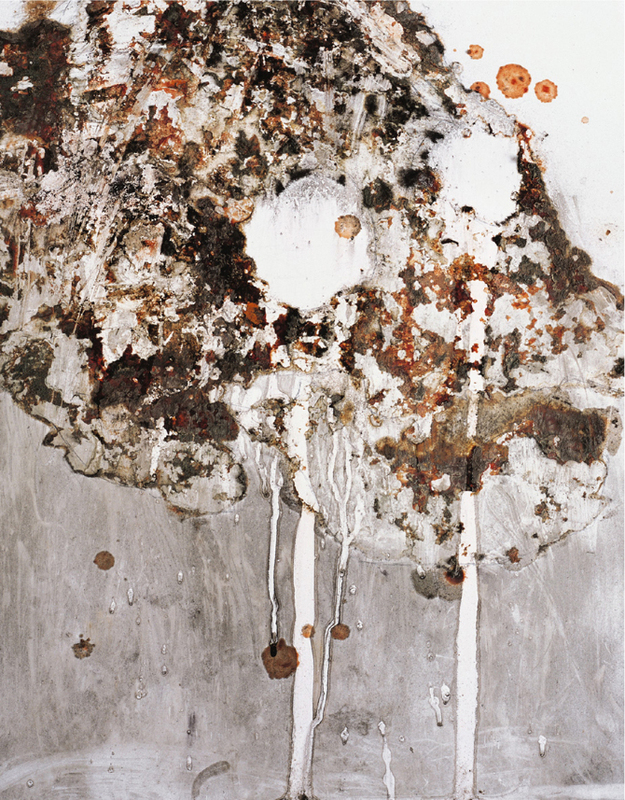 Earlier works include ‘Pandemic’ (2009), a series of photographic studies of mould that look like the last traces of life in a dying world, and ‘Badland’ (2010-11), a series shot in the studio in which androgynous human beings appear to be as artificial and repulsive as the fetid objects that they try to adapt as tools and clothing. Far less abject than these works, the ‘Every Single Crash’ series still have the capacity to disturb. This may have to do with the ‘creepy’ associations of some materials that first drew Berendt into the shops of Taipei, as well as the intense concentration of colour in the works. We come to images cued to perceive them. Our experiences of colour, movement, sight, sound, smell and touch, form a kind of memory field against which we judge all images but photographs in particular. Held back from complete abstraction, Berendt’s images seem to hover on the edge of a distinctly palpable and yet unknowable world. This has much to do with the way they seem to call for and, at the same time, deny touch. We engage with the world responsively, testing our expectations against experience. Hard or dry, soft or wet? We like to touch things for the veracity and certainty that this sense provides. Philosopher Georg Hegel claimed that, of all the senses, only touch can give a sensation of spatial depth. ‘Initially,’ he writes, ‘the child only has the sense of light, though which things are made manifest to it. This mere sensation misleads the child into grasping at distant objects as if they were near at hand. However, the child learns about distances through the sense of touch. Thus it acquires a sense of visual proportion and casts which is external outside itself.’ Even when touch is not possible (or, meaningful in an immediate sense, as in the case of almost all photography), we still rely on haptic memory. Occasional notes in Berendt’s compositions seem to offer these cues of familiarity – rippling waves of light across a surface suggest cool smoothness or perhaps the grainy texture indicates sawn timber – but for the most part these images seem to confuse our sensory memory. Perhaps this is where their fascination and even their creepiness lies. In September 1974 Vitaly Komar and Alexander Melamid exhibited four works at an exhibition of nonconformist art in Moscow, which had been reluctantly permitted by the authorities. Two weeks earlier, the artists had had an artwork – a double self-portrait as Vladimir Lenin and Joseph Stalin – destroyed in the notorious demolition of the ‘Bulldozer Exhibition’, another open-air display of nonconformist art. The state-sponsored violence (conducted by loyal workers outraged at the anti-Soviet art, according to official reports) had caused a storm of international protest and so a second exhibition was hastily organised. Komar and Melamid’s canvases in this second show appeared to be heavily damaged showpieces of pop art: they included versions of one of Andy Warhol’s 32 Campbell’s Soup Cans 1962 and Robert Indiana’s The Confederacy: Alabama 1965. 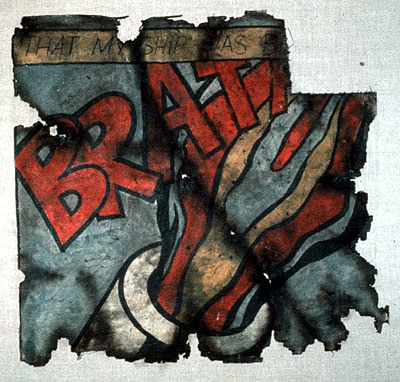 Works from their ‘Post-Art’ series, the canvases appeared as if they had been salvaged by citizens of the Soviet Union from some kind of catastrophe that had befallen capitalist America. Interpreted in these eschatological terms, Komar and Melamid’s works could be aligned with official analyses of history in the Soviet Union. In the early 1970s, Nikita Khrushchev’s 1961 ringing promise to ‘catch up and overtake the West’ was still being repeated by the Kremlin (even when it was widely known that the Soviet Union was dependent on importing US food stuffs and machinery). Nevertheless, Komar and Melamid’s ‘Post-Art’ hardly represented orthodoxy: art in the Soviet Union during the Leonid Brezhnev era (1964–82) was to provide ringing, uplifting images of Soviet progress. Pop art was an unmistakably foreign phenomenon to both its champions and enemies in Eastern Europe during the Cold War. A number of Soviet commentators – including prominent aestheticians – wrote book-length studies of pop art in the 1960s and early 1970s. Their objection to pop art belonged to a broader critique of what ideologues called the ‘decadence’ of the West, a word that signalled the abandonment of the uplifting role of culture in favour of base and selfish pleasures. As such, pop art presented a pronounced version of what Soviet critics detected more generally in modernism. 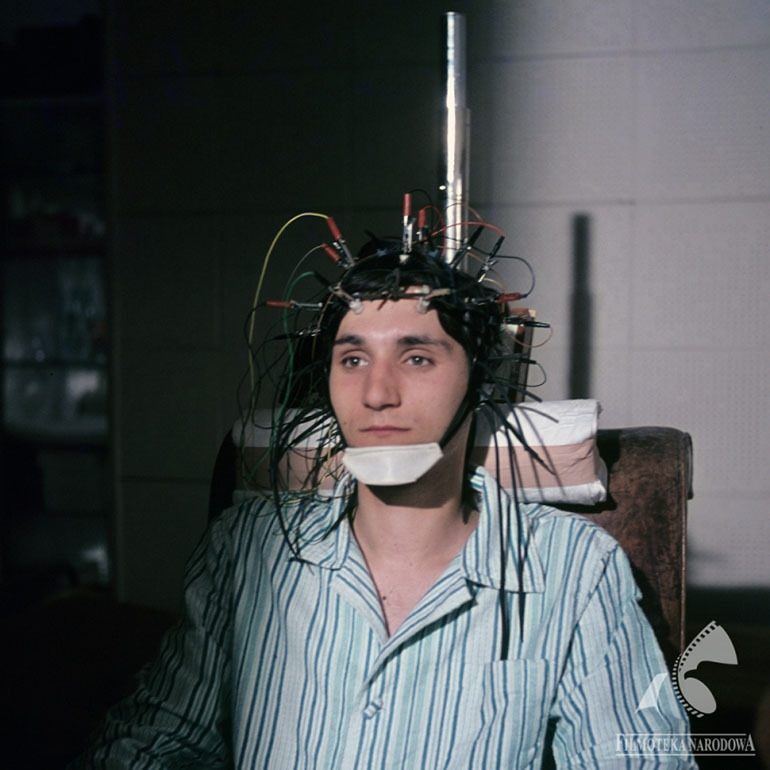 Their high-minded critiques were also underscored by deep-set anxiety about the effects of mass culture in the Soviet Union. As the state invested in television, pop music and limited forms of consumerism, to satisfy the growing expectations of Soviet citizens, patrician ideologues worried about what they saw as their pernicious effects. Even if the Soviet engagement with pop art was predominately antagonistic, it testifies to the fact that the works of Andy Warhol or Robert Rauschenberg as well as pop art from Western Europe was known, at least indirectly, through their reproduction in books and magazines. These materials often arrived ‘off set’, via the ‘fraternal’ nations of the Eastern Bloc where, by comparison, more liberal cultural policies were in place. 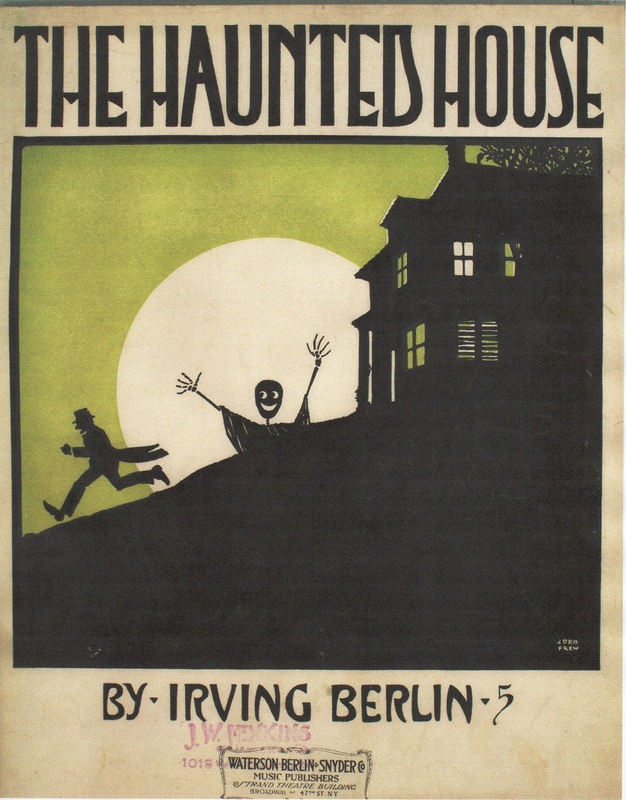 Many Soviet artists and critics testify to having read illustrated magazines such as Projekt (Poland) and Umění (Czechoslovakia) to extract information about developments in the West. Well-travelled and well-informed writers like Jindřich Chalupecký in Czechoslovakia and Urszula Czartoryska in Poland wrote articles and books on contemporary art that detailed the activities of the Independent Group in London or the Sonnabend Gallery in New York. Their analyses were remarkably free of the heavy hand of official ideology and might even be read indirectly as a critique of Soviet culture. In his 1965 book, Umění dnes (Art Today), Chalupecký, for instance, characterised pop as social critique, writing: Too often art disguises the truth: here, instead, it is revealed. This is the theory and the practice of anti-art. [Daniel] Spoerri only fixes a random piece of ordinary reality in his ‘snare pictures’ (a table with the dishes after a meal, a shelf with spices); Wolf Vostell uses the direct methods of Pop Art – such as reproduction of news photographs – to make a shocking critique of modern society. Czech readers may well have interpreted Chalupecký’s words as a rebuttal of the seemingly unshakeable Soviet tenet of realism in the arts. Opportunities for the citizens of Moscow’s satellites in Eastern Europe and former Yugoslavia to see works of art by Western pop artists first hand also occurred, albeit infrequently. The first exhibition of pop art in the region, featuring screenprints by Jim Dine, Allen Jones and Andy Warhol among others, was held in Belgrade and Zagreb (both in former Yugoslavia) in 1966 with sponsorship by tobacco concern, Philip Morris International. Three years later the Smithsonian Institution organised a larger touring show of American art after 1945 entitled The Disappearance and the Reappearance of the Image, which featured works by Warhol, Roy Lichtenstein, Rauschenberg and Claes Oldenburg. It travelled to various Eastern European cities including Prague (former Czechoslovakia) (remarkably twelve months after Warsaw Pact forces repressed the reform movement there). These US displays belong to the long and well-recorded history of attempts to use modern art and design to broadcast ‘American values’ during the Cold War. Interest in pop in Eastern Europe also took in its Western European variants. Strong French connections in Poland brought the works of Alain Jacquet, a representative of nouveau réalisme, to the Muzeum Sztuki in Łódź, Poland, where he had a solo exhibition in May–June 1969, and to the Foksal Gallery in Warsaw, where he arranged a performance of ‘Le Tricot de Varsovie’, which involved the production of a large soft sculpture in situ. The effect of these various encounters with spectacular works of pop art on artists from Eastern Europe is clear. A number of young artists went through a pop phase. Hungarian painter László Lakner, for instance, who has admitted a debt to Rauschenberg, started doubling and fragmenting his careful renderings of documentary photographs and masterpieces of art history. Instead of using the mechanical process of screen printing, Lakner painted these photographic details by hand. Later, in the 1970s, he was to extend his interest in documents in conceptual and photorealist works. In former Yugoslavia, Tomislav Gotovac – later well known as a performance artist and filmmaker – made numerous collage works throughout the 1960s using advertisements, packaging and pages from magazines from the West and, as Yugoslavia underwent its own consumer revolution, from local sources too. 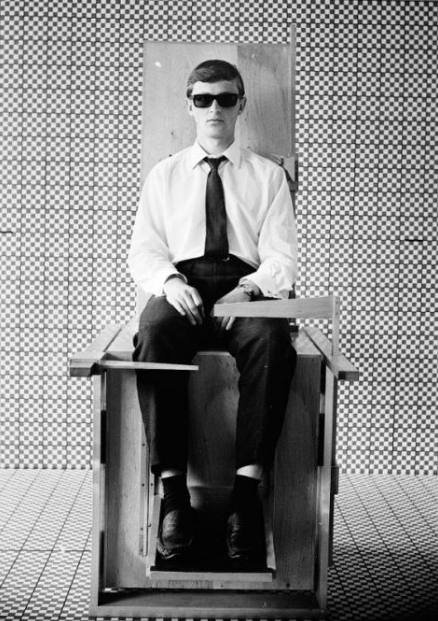 Leonhard Lapin, the central figure in nonconformist art in the former Estonian Soviet Socialist Republic, was one of the founders of a short-lived pop alliance called ‘Soup 69’ (another reference to Warhol) at the end of the 1960s. For these and other artists, pop was often a brief experiment in careers that were later made in performance, conceptual art, experimental film or other artistic practices that established deeper footings in the artistic cultures of Eastern Europe in the 1970s. Pop provided an introduction to the practice of appropriation, a rebuttal of the shibboleths of modernist art: self-expression, originality and individuality. This was what made this embryonic and fleeting engagement with pop at the end of the 1960s an important watershed: the revival of modern art, and of abstract painting in particular, after the death of Stalin and the so called ‘Thaw’ of the mid-1950s had been strongly motivated by humanist principles, not least intellectual and artistic freedom. Ten years later new questions about the effects of the mechanised image seemed to press on the minds of artists in Eastern Europe. Major’s doleful text emphasised the alienness of many international currents in modernism, even those that had Hungarian-born pioneers. His point could be extended to other Eastern Bloc cultures too. Moreover, critics – particularly those writing about the Soviet Union – have often denied the existence of pop art in Eastern Europe under Communist rule because consumerism never succeeded there. The fact that Eastern European citizens confronted shortages and queues in their daily lives is undeniable, but that does not mean that they were unaware of the existence of consumer goods. In Eastern Europe under Communist rule, this knowledge could be both a matter of fantasy and of frustration. Consumer goods and images acquired from the West – particularly clothes, cosmetics, foodstuffs and LP records – gained special significance. Mundane in their original, capitalist context, such things came to carry a heightened importance not only because of their rarity but also because the unfamiliar materials and seductive forms of Western consumer goods could trigger fantasies about capitalist civilisation. 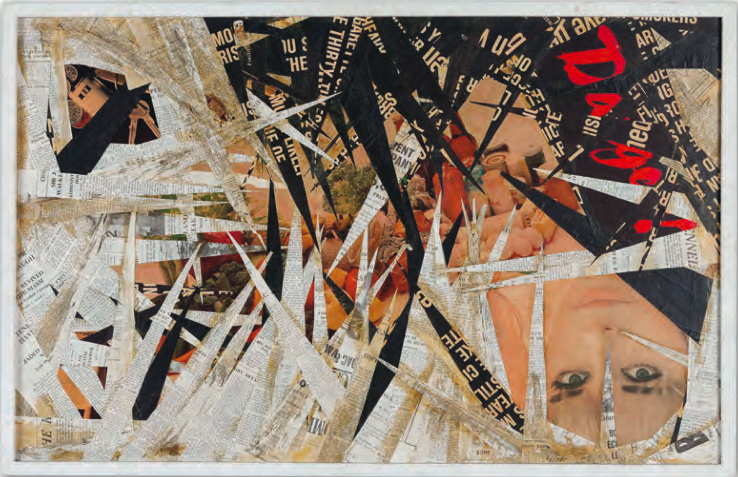 Gotovac’s early pop collages – featuring pin-ups and branded goods from the West – are full of libidinal desire. Frustration that was felt strongly by many citizens in the former Yugoslavia and the Eastern Bloc was the product of the gap between expectation (opened up by Soviet promises to ‘catch up and overtake the West’) and experience. In fact, many countries in Eastern Europe underwent their own consumer revolutions at the end of the 1960s in which ‘soft sell’ advertising, brightly packaged and branded consumer goods, new kinds of shops such as supermarkets and fashion boutiques as well as ‘lifestyle’ magazines promised ‘socialist consumerism’. March 1967 issue of Ty i Ja (You and I) magazine published in Poland. In the recursive fashion characteristic of pop in the West too, many film posters, magazine covers and LP sleeves featured serial images that were dressed in the flattened forms and bright colours of pop art. The response to the spread of commodity aesthetics across what Polish art historian Mieczysław Porębski called the ‘ikonosfera’ (iconosphere) was not uncritical. The cultural détente between east and west is not accidental! On the one hand, homo consomator buys a bottle of whiskey and as a free gift the lie that accompanies it. On the other, Communist man buys ideology and gets as a free gift a bottle of vodka. Paradoxically, Soviet and capitalist regimes are taking a common path, the first thanks to their economy of production, the second thanks to their economy of consumption. So was there a distinctly Eastern European pop art? Can the phenomenon only be understood as ripples of what Czartoryska called a ‘wave’, which originated in the West? Pop was, as she observed in 1965, a form of art that in its original setting passed comment on the incessant demands of mass media images on their audiences not through direct and explicit critique but through repetition, multiplication and concentration (‘their creativity is a kind of dramatic intensification of sensation’). Viewed in these terms, the chief claim on the title of Eastern Bloc pop must surely belong to Sots-art. A compression of two terms (Sotsrealism/pop art), Sots-art was coined by the Russian duo Komar and Melamid to describe their own artworks in 1972. In this year they began creating works that treated the mass slogans and political images that formed a ubiquitous backdrop to life in the Soviet Union as art. 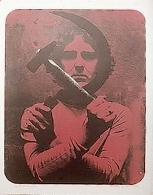 Early Sots-art works included Our Goal-Communism 1972, a plain red banner painted with a slogan in white block letters and signed by the artists. Another in the series, entitled Quotation 1972, simply replaced the letters with tidy white blocks arranged in a grid bracketed with quotation marks. This was a code, seemingly without a message. Nevertheless, it made a point that was articulated a few years later by the Czech dissident writer Václav Havel describing a Communist Party poster: ‘The real meaning of the … slogan has nothing to do with what the text of the slogan actually says. Even so, this real meaning is quite clear and generally comprehensible because the code is so familiar.’ Other Komar and Melamid works approached ideology as a commodity, as if illustrating Vaneigem’s words above. In 1974 the duo created a series of ersatz products: hamburgers ground from a copy of Pravda (itself a performance and Leo Tolstoy and Maxim Gorky Flavoured Vodka (the latter featuring Isaak Brodsky’s 1936 much-reproduced portrait of the Soviet writer on the label). Alongside the painter Eric Bulatov, Komar and Melamid were the first artists to rework the codes and symbols of Soviet propaganda. Often exercises in appropriation, their early works have a kind of cool, ironic tone that is lacking in the sardonic combinations of Western adspeak and Soviet imagery characteristic of much later Sots-art. The ambivalence of irony has allowed critics to read other works produced in Eastern Europe as critical commentaries on power. 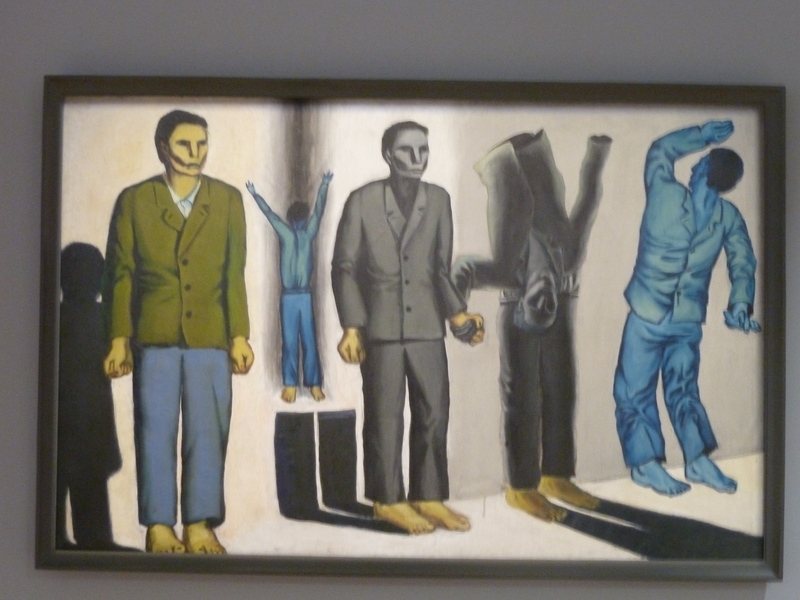 Young Yugoslav artist Dušan Otašević’s triptych To Communism, Lenin’s Way 1967 featuring the Bolshevik leader is a case in point. 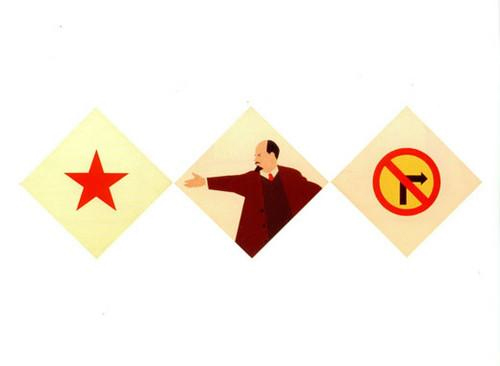 Lenin gestures to a five-point red star on the left-hand panel while another, on the right, has a traffic sign marked with the symbol for ‘no right turn’. 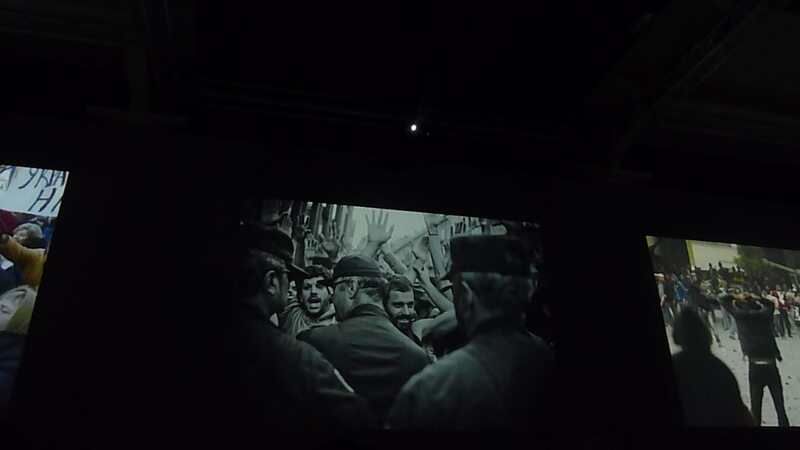 Produced in the year when much of the world was reflecting – often critically – on the fiftieth anniversary of the October Revolution and Lenin’s image was being widely reproduced, Otašević’s telegraphic aesthetic perhaps alluded to the enervation of the revolutionary spirit. Other works of this period include his Comrade Tito, White Violet, Our Youth Loves You 1969, a combine made from timber and aluminium panels with a vividly-coloured portrait of the Yugoslav leader as a Second World War partisan, under an ‘empty’ red star. Kitsch, and seemingly composed in the manner of amateur propaganda displays, Otašević’s portrait lacked the aura of heroism and ideological sanctity that characterised almost all Yugoslav representations of Tito. Weighing up the political character of these and other works by Otašević, Branislav Dimitrijević has characterised them as ambivalent reactions to the ways in which socialist ideology and Western consumer culture were becoming entwined. The extent to which pop art in the West constituted a critical practice has preoccupied many critics and historians. Although pop works produced in Britain and the USA in the 1960s once seemed to have critical and anti-authoritarian potential, they were subsumed easily within the gallery system. Writing of the work of celebrity artists such as Warhol, Jean Baudrillard in 1970 made his reading of pop and consumption clear: it was the end of the modernist avant-garde, a ‘total integration’ of the artwork into the political economy of the commodity-sign’. Sots-art used many of the same procedures as pop, not least the appropriation of the official imagery that was central to the propaganda apparatus. Yet such works could hardly be absorbed in the same manner. Those made by Komar and Melamid, Pinczehelyi and Otašević maintained a cool distance when power required eagerness; and offered ambivalence when official culture called for commitment. See Laura J. Hoptman and Tomáš Pospiszyl (eds. ), Primary Documents: A Sourcebook for Eastern and Central European Art Since the 1950s, New York 2002, pp.65–77. Jutta Scherrer, ‘“To Catch Up and Overtake” the West: Soviet Discourse on Socialist Competition’, in Katalin Miklóssy and Melanie Ilic (eds. ), Competition in Socialist Society, London 2014, p.11. See, for instance, Mikhail Alexandrovich Lifshitz and Lidija Jakovlevna Rejngardt, Krizis bezobrazija. Ot kubizma k pop-art, Moscow 1968; Viktor Sibirjakov, Pop-art i paradoksy modernizma, Moscow 1969; M. Kuz’mina, ‘“Pop-art” in the Anthology’, Modernizm, Moscow 1973. See, for instance, Iurii Gerchuk, ‘The Aesthetics of Everyday Life in the Khrushchev Thaw in the USSR (1954–1964)’, in David Crowley and Susan Reid (eds. ), Style and Socialism, Oxford 2002, pp.81–96. See Jindřich Chalupecký, Umění dnes, Prague 1966; Urszula Czartoryska, Od Pop-Artu do Sztuki Konceptualnej, Warsaw 1972. See Boris Kelemen (ed. ), Pop Art, exh. cat., Galerija Suvremene Umjetnosti, Zagreb, March 1966. Michael L. Krenn, Fall-out Shelters for the Human Spirit: American Art and the Cold War, Chapel Hill, North Carolina 2005. 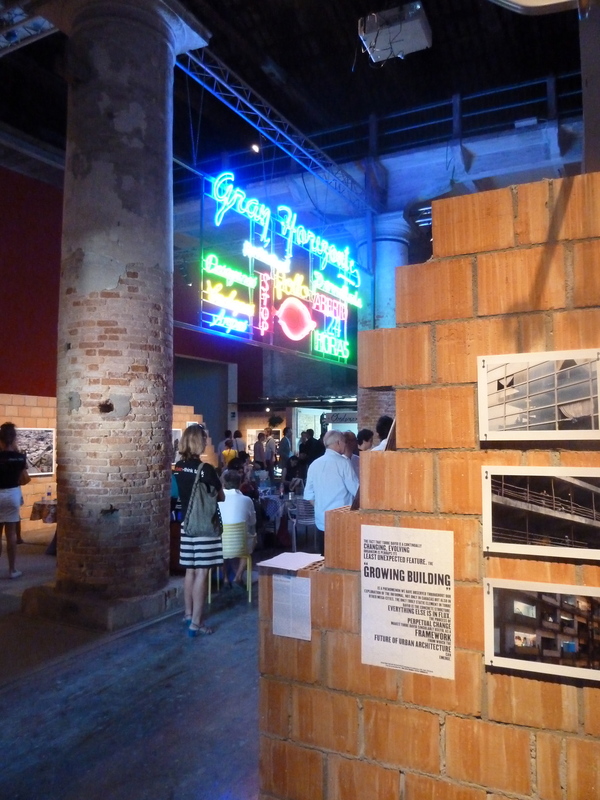 Lakner described witnessing Rauschenberg’s works in the American Pavilion at the Venice Biennial in 1964 as being like a blow to the head. Lakner cited by Péter Sinkovits, ‘Progresszív álmok: beszélgetés Lakner Lászlóval’, Új művészet, vol.16, no. 4 2005, pp.4–7. See Sirji Helme, Popkunst Forever. Eesti popkunst 1960. ja 1970. aastate vahetusel, Tallinn 2010. 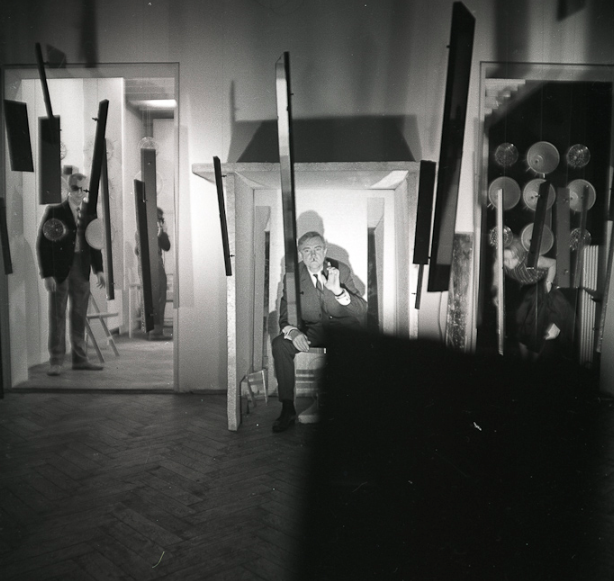 Piotr Piotrowski, In the Shadow of Yalta: Art and the Avant-garde in Eastern Europe, 1945–1989, London 2011, pp.61–105. See Claus Groh, Aktuelle Kunst in Osteuropa, Koln 1972. János Major cited by Anik Cs. Asztalos (Éva Körner), ‘No isms in Hungary’, Studio International, March 1974, pp.105–11. Matthew Jesse Jackson, The Experimental Group: Ilya Kabakov, Moscow Conceptualism, Soviet Avant-Gardes, Chicago and London 2010, pp.69–70. See David Crowley and Susan E. Reid, ‘Introduction’, in Pleasures in Socialism. Leisure and Luxury in the Eastern Bloc, Evanston, Illinois, pp.3–51. Mieczysław Porębski, Ikonosfera, Warsaw 1972. Raoul Vaneigem, The Revolution of Everyday Life, trans. John Fullerton and Paul Sieveking, London 1979, p.36. Urszula Czartoryska, ‘“Kronika” Andy’ego Warhola’ (1965), in Pisma Urszuli Czartoryskiej: perspektywy historyczne, ed. Leszek Brogowski, Gdańsk 2006, p.155. Czartoryska (1965) cited by Jerzy Kossak, in Dylematy Kultury Masowej, Warsaw 1966, p.97. Václav Havel ‘The Power of the Powerless’ (1978), in John Keane (ed. ), The Power of the Powerless. Citizens Against the State in Central-Eastern Europe, trans. Paul Wilson, London 2009, p.15. Aleš Erjavec, ‘Introduction’, in Postmodernism and the Postsocialist Condition: Politicized Art Under Late Socialism, Berkeley, CA 2003, p.37. Beke cited by Klara Kemp-Welch, in Antipolitics in Central European Art: Reticence as Dissidence under Post-Totalitarian Rule 1956–1989, London 2014, p.163. 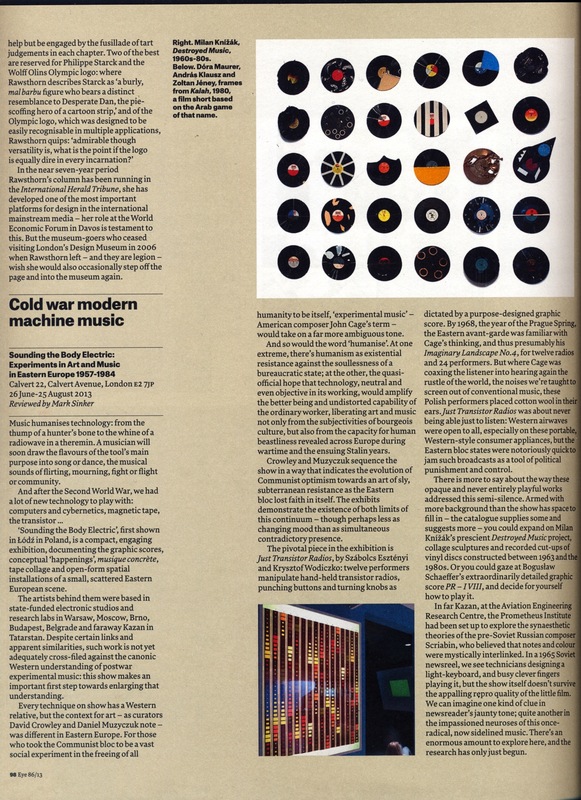 See Branislav Dimitrijević, ‘DIY POP: Artistic Craftsmanship of Dušan Otašević’, in Dušan Otašević – popmodernizam/popmodernism. Retrospektivna izložba 1965–2003, exh. cat., Muzej savremene umetnosti, Belgrade October–December 2003, p.112. Jean Baudrillard cited by Hal Foster, The Return of the Real: The Avant-garde at the End of the Century, Boston, MA 1996, p.128. 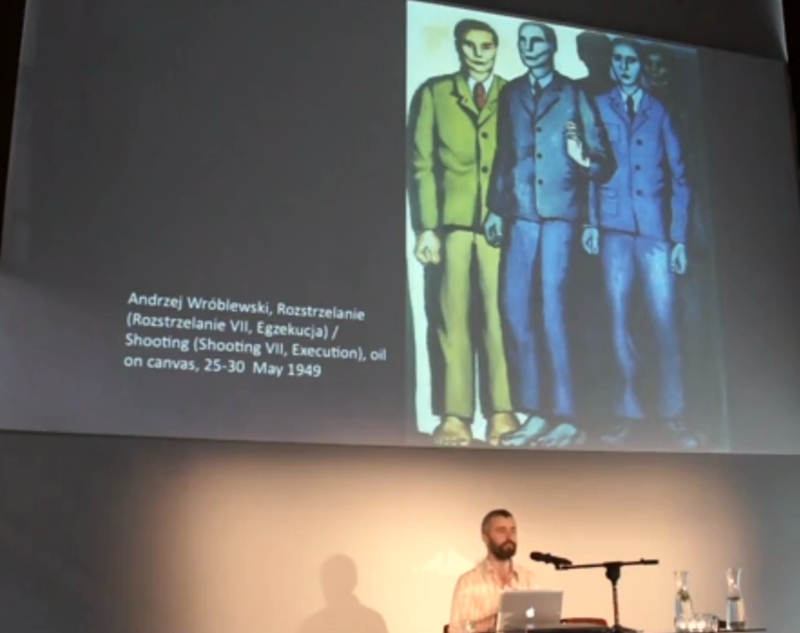 In September 2013, I gave a lecture on the great painter, Andrzej Wróblewski, at the Museum of Modern Art in Warsaw. You can watch it here. 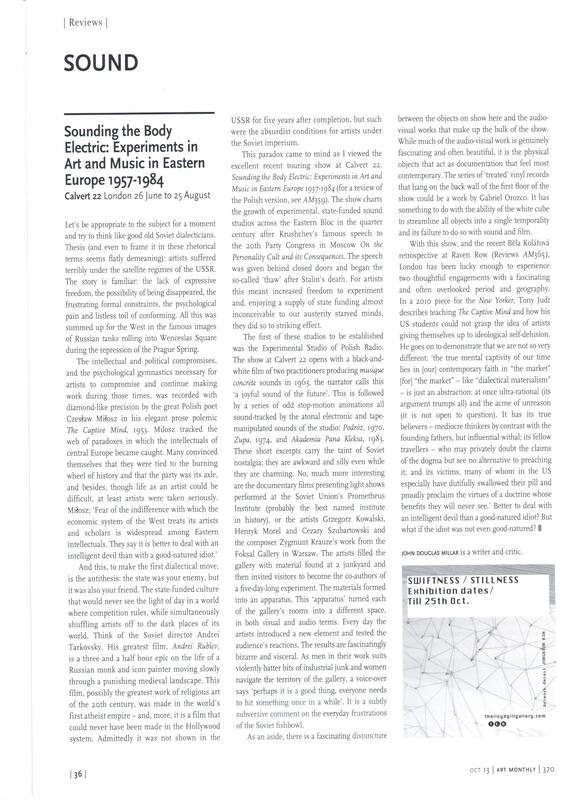 This piece was published in the epiphanies section of the June 2013 issue of the The Wire ♦ The centre of Pest – Budapest’s Rive Droite – is dense and busy, packed with elegant buildings dating from the city’s heyday before the First World War. They feature in the elegant images of the Hungarian capital usually promoted by tourist offices. But as you head south along the river to its outskirts, the city loses its character, becoming a disconnected landscape of wide roads, billboards, red brick chimneys, decrepit factories and train tracks. The main drag, Soroksári út, is flanked by empty plots, flattened, perhaps, in 1944 when the Soviet Red Army laid siege to the city. A few nondescript 19th century tenement buildings still stand, but most seem to be boarded up. I know this road well because I walked up and down it a few times a couple of years ago looking for Katalin Ladik’s home. Eventually I found it, and her, in a tenement organised around a crumbling courtyard, now an echoing playground for wild kids. I was then gathering material for an exhibition of experimental art and music from Eastern Europe before 1989 and wanted to include Ladik’s work. You may well have seen her perform. Last year, she made an appearance in Peter Strickland’s eerie film, Berberian Sound Studio. Playing a resurrected witch, she is ushered into the Italian sound studio to supply explosive screams for a horror movie being overdubbed there. Budapest-based Strickland paid her the credit of having her introduced as Signora Ladik on screen, testimony to her unique voice. A Hungarian from the multi-ethnic Vojvodina region of Serbia, Ladik has been active since the mid-1960s. As a poet, actress, visual artist and performance artist, she was an animated and controversial spirit in the neo-avant garde in Yugoslavia in the 1960s and 1970s. But she left the country in 1992 at the start of the Yugoslav wars. It was clearly a traumatic experience, and Ladik was still feeling the loss of her home when I visited her. Yugoslavia – despite the terrible violence and intolerance that erupted in the 1990s – had been a remarkably fertile space for art in the 1970s. I knew her work in that way that occurs when you slowly notice that someone or something never leaves your side vision. Without realising it, she had been a point of connection for so many images and sounds that interest me. 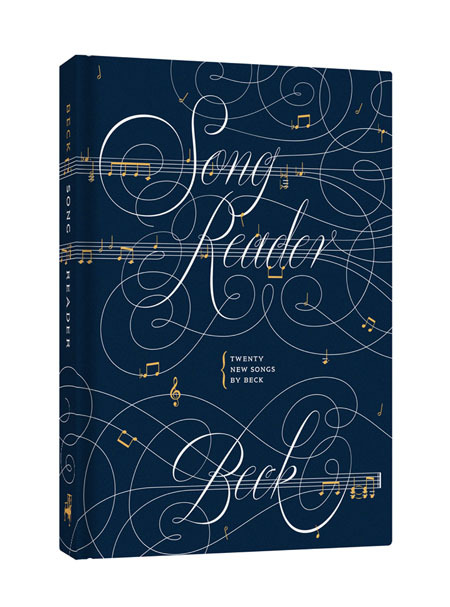 Her first marriage was to Ernö Király, the composer and ethnomusicologist who used folk instruments as the sound source for his tape music in the 1960s. She performed with Dubravko Detoni and Milko Kelemen’s experimental group Acezantez, realising one counterculture’s fantasy of liberation by appearing naked on stage. Later in the 1970s she played a central role as a vocalist in what must have been a truly monumental performance of Kurt Schwitters’s Ursonate. Conducted in Belgrade by Oskar Danon, it involved four vocalists, four orchestras and banks of tympany, all augmented – as if anything else might be needed Đ with Vladan Radovanović’s tape music made from samples of folk, electronic works and pop songs. In 1973, when she was a member of Bosch + Bosch art group, Ladik crossed the border to Balatonboglár in Hungary, where young artists had rented out a disused chapel. 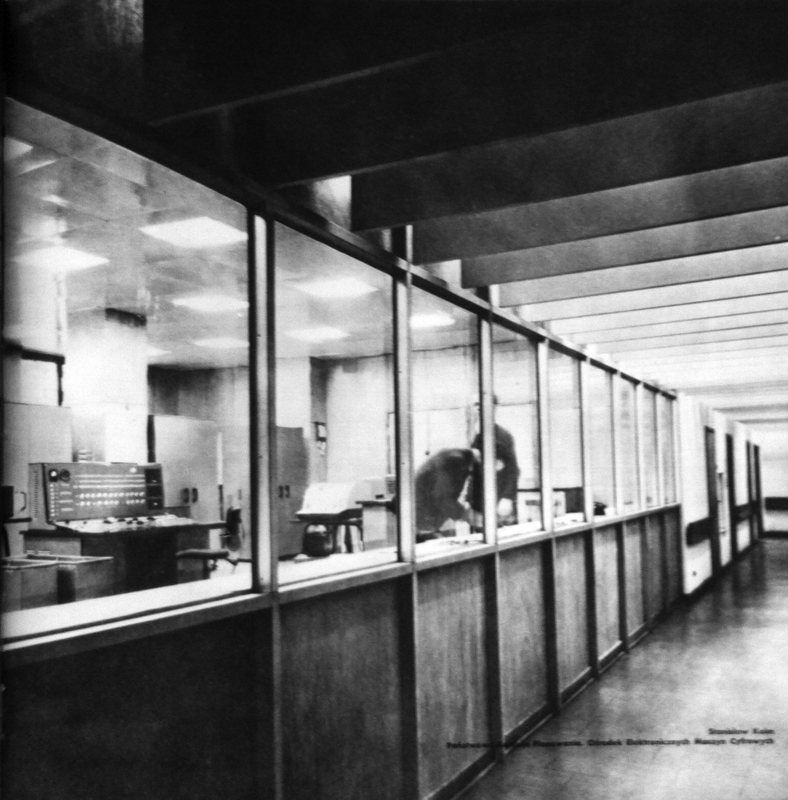 40 years on, long after the police had closed it down, the place has a kind of mythical status as a laboratory of conceptual art and what art historians like to call “the dematerialisation of the object”. She performed O-pus there, an improvised sound poem exploring the register of intense sensations stored in the phonic O (“oh!” to “oooooooooooooooo”). 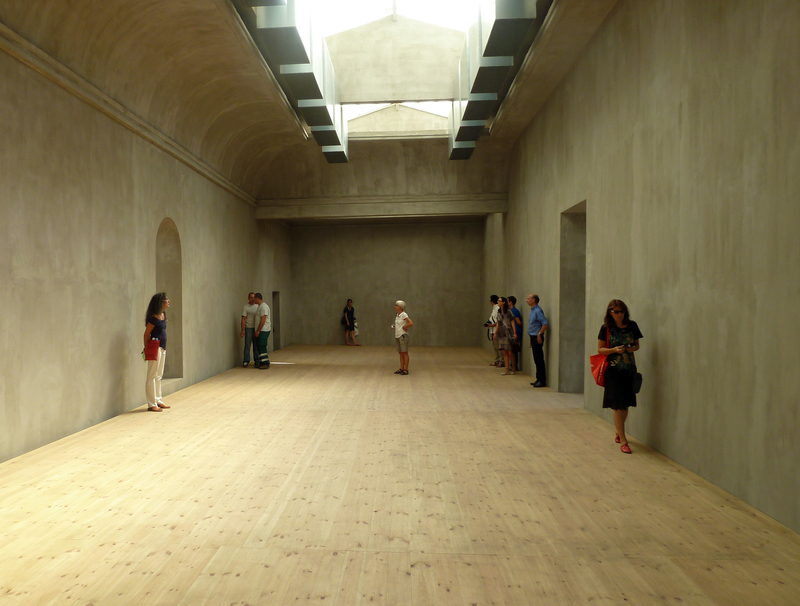 Even then, of course, conceptual art was a specialist interest. But Ladik was also a celebrity, kind of. She often performed naked, treating her body like an instrument by running a primitive bow across her hair. When, in 1975, these performances attracted the attention of mass market magazines, she was expelled from the League of Communists of Yugoslavia for ‘immorality’. In the paradoxical fashion of Yugoslav socialism, she then became a star on state TV, appearing in one of its forays in erotica. Her science fiction and fantasy films from the early 1980s form a particular kind of late-socialist kitsch. Ladik was never a campaigning feminist, and her performances always placed female subjectivity at the fore, often in uncompromising ways. In the early 1970s she created a remarkable body of graphic scores collaged from material sliced from West German women’s magazines, sewing patterns and popular music sheets from the 19th century. I knew that she had employed these artworks as graphic scores in live performances. There is a grainy photograph of her performing such a piece at the Belgrade Student Centre in the mid-1970s. But I did not know how they were used or what her interpretations sounded like. When I asked her, she took me to her kitchen where she stood in front of a score framed on the wall and began to sing. Her voice was and remains simply extraordinary – sweeping across an unnatural sonic spectrum from high frequency trilling to low rumbling tones. Expressing neither lyrics nor words, Ladik nevertheless seemed to draw on the full phonetic range of both Hungarian and Serbian, her two native languages in Vojvodina. Strangled plosive stops from Hungarian phonemics combined with the rattling cadences of the Slavic language. I had heard recordings of her voice before, of course, but what was so striking about this impromptu performance was the remarkable force of her breath. You could almost hear the air being struck, as dozens of different women tumbled out of her mouth. Patently being generated by Ladik, these sounds did not seem to belong to her. It was precisely this uncanny, even disturbing quality in her voice that Strickland celebrates in his film; I had the unnerving pleasure of being given a private performance. 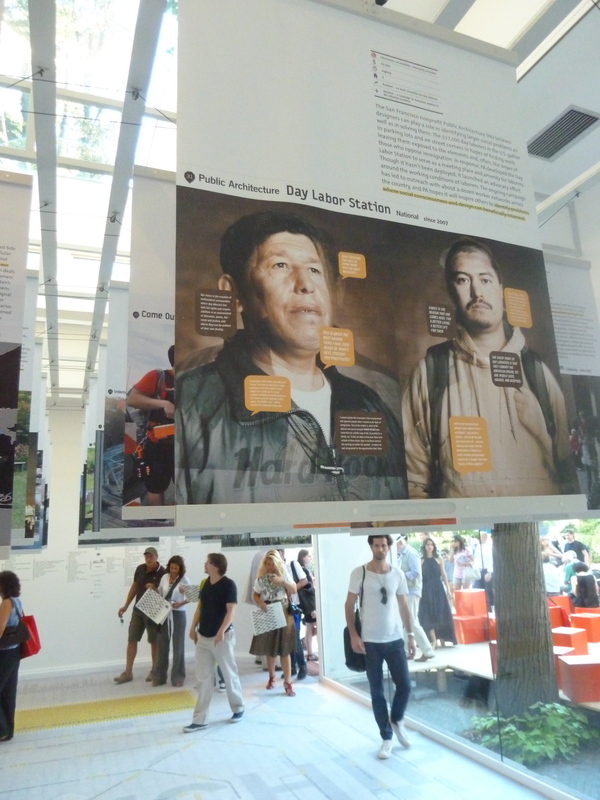 A new version of the 2012 show opened at Calvert 22 in London in late June 2013. it ran until Aug 26th. 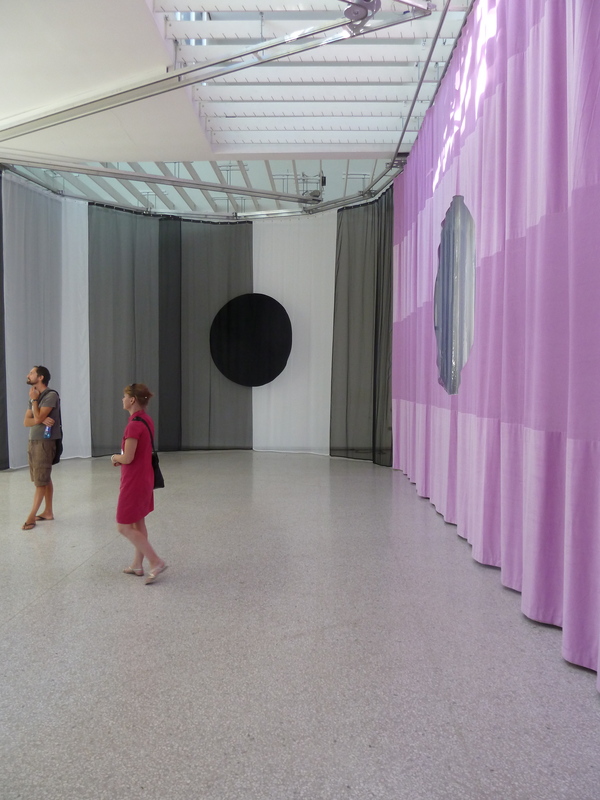 Here is a gallery of installation shots – courtesy of Calvert 22. There is also some footage of me talking about the show on the Calvert site here. You can download a pdf of the Calvert catalogue here. 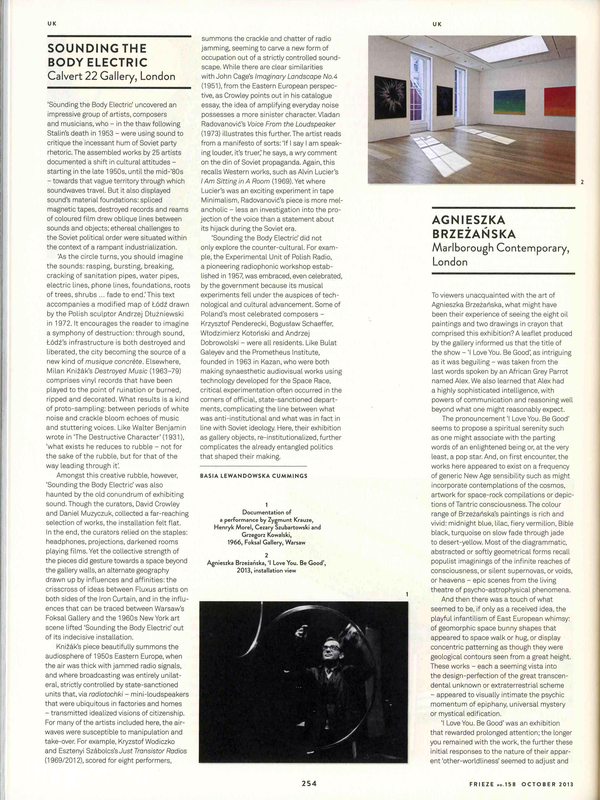 Here is a link to a review in Frieze magazine; another in Eye and a third review in Art Monthly. 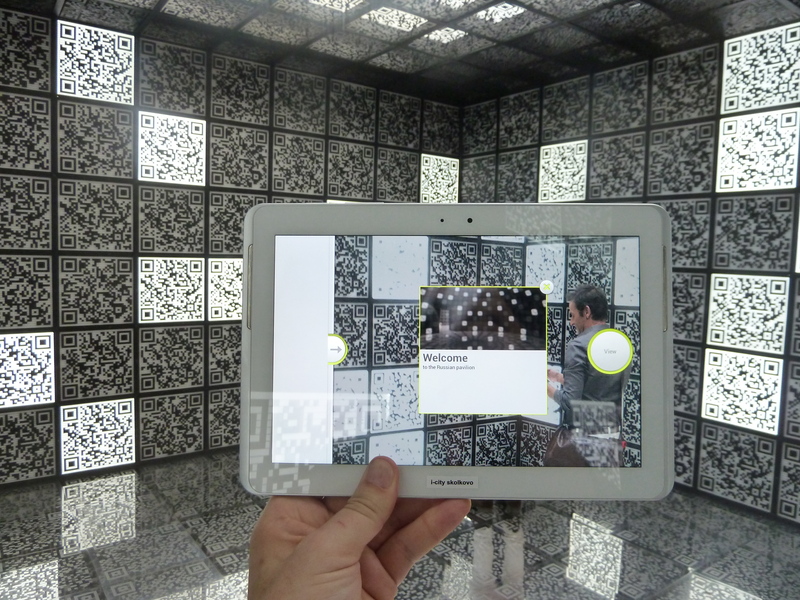 You can hear a talk presented at MoMA in spring 2013 here as well. Honzík – how high the sky? This is an extract of a talk which I will present at the ‘Afterlives of Constructivism‘ conference at Princeton University in May 2013 ♦ At the height of the period of liberalization in Czechoslovakia in the mid 1960s, architects began imagining the kind of ambitious projects for cities and buildings that went far beyond the official imperative to build ‘economically and quickly’ and eschewed the technocratic role given to architecture in socialism. 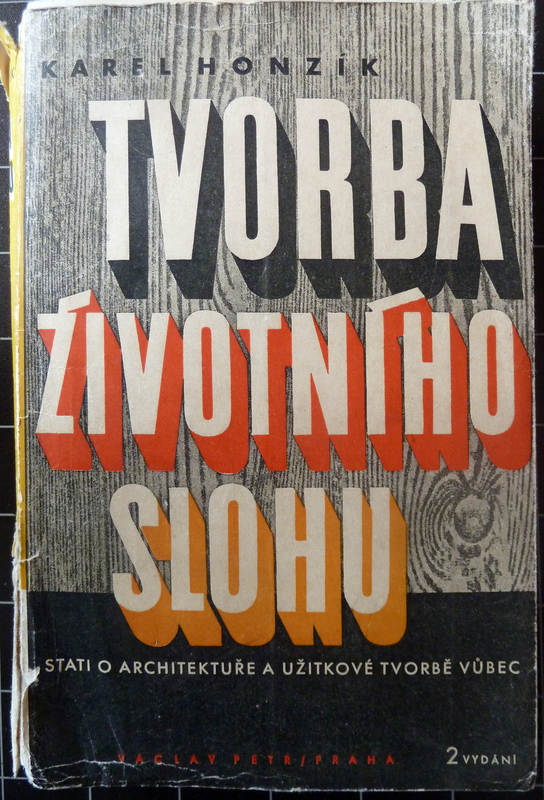 As architect and critic Jiři Hrůza argued – perhaps boldly – his 1967 book The Utopian City (Město Utopistů), surveying many speculative projects including those designed by Leonidov and Chernikov in the 1920s as well as those of his contemporaries such as Karel Honzík, the future could operate as a critique of the present: ‘Just as we can find in the concepts of utopian architectural avant-garde both audacious and prescient anticipations of the future, we can also find escapism from the coarse and prosaic reality of life, an ideal dream formed in disillusionment with the present …‘. 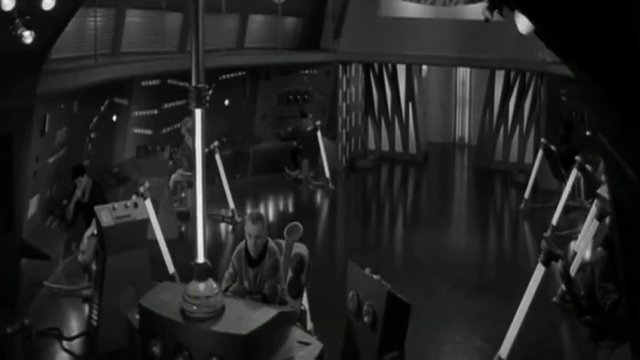 [i] To find a way out from this kind of impoverishment, Hrůza directed his readers to science fiction. There they might discover a rich vein of imagination unfettered by mundane concerns. A few years later after the prohibition on modernism had been lifted, Honziík, then unwell and in semi-retirement, began working on experimental housing schemes. His designs self-consciously revive the idea of the collective home as a single megastructure, a preoccupation of Soviet architects at the end of 1920s (cf Barshch and Valdimirov’s schemes c. 1929-30). 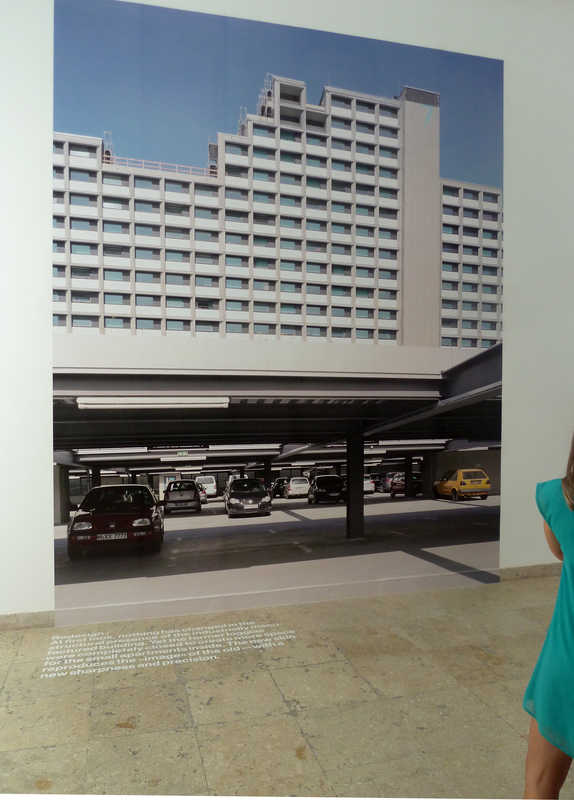 Honzík’s vision for ‘vertical community’ living, ‘Domurbia’ (1962-64) took the form of three massive blocks connected by high bridges and a common service zone on the lower floors. 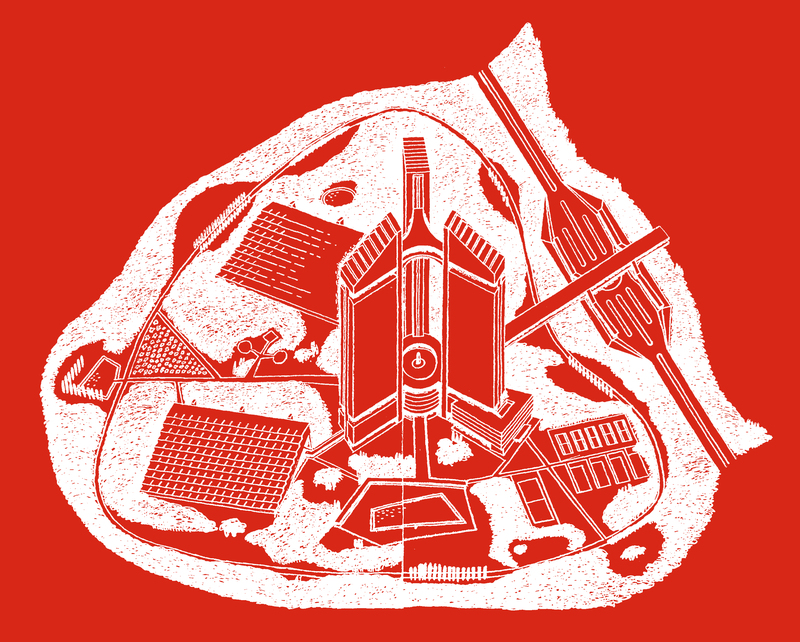 All human needs of the 2000 inhabitants – social, health, educational and domestic – would be served in one structure. This proposition, though still unbuildable, had little of the imaginative reach to warrant the label ‘experimental’ or ‘utopian’ – this baton had been passed to ambitious young architects designing bravura socmodernist structures like the much-lauded television tower and hotel on the peak of the Ještěd mountain (Stavoprojekt, Liberec, 1963-73) or Slovak National Radio headquarters in Bratislava (Štefan Svetko, Štefan Ďurkovič and Barnabáš Kissling, 1962-85). 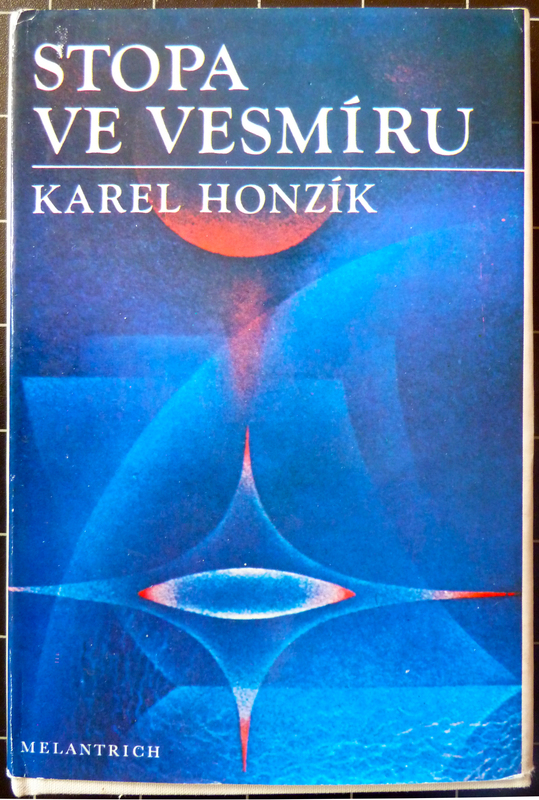 Trace in the Universe, published in the 1980s – after Honzik’s death. Honzík’s architectural imagination had perhaps been debilitated by his experiences but it was still exercised vividly in his science-fiction novels and short stories written from the late 1950s (few of which were published during his lifetime – he died in 1966). His story, Trace in the Universe (Stopa ve Vesmíru) describes an ideal society of intelligent extra-terrestrial beings who have achieved full communism. War and private property are things of the past and the state has withered away. They live, unsurprisingly, in tower- cities. New buildings are manufactured and delivered to site by aeroplanes. Others have mobile facades. All needs are met by machines and, in an echo of his earlier writings, all consumption is governed by the rational principles of need. The beings who enjoy this world are not human: they have evolved from a squirrel-like progenitor. Honzík’s point being that all intelligent life would ultimately follow a path predicted by Marx towards communism. 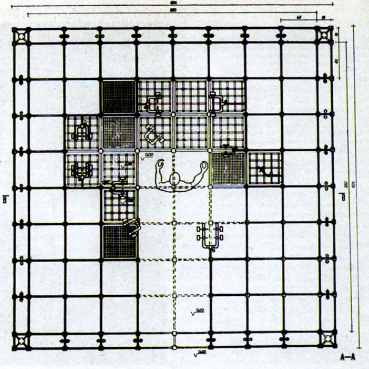 [iii] ‘Konečné rozloučení s třicetiletou érou konstruktivismu’ Architektura ČSR, 12, 1953, 141-144. [iv] See Jiří Jiroutek, Fenomenen Ještěd (Liberec 2005) 66; see also ‘Excerpts from an interview with Karel Hubáček’, in Mašinisti, exh. cat., Fragner Gallery (Prague 1996)138.